guest post by Oded Nir: It is by now almost a cliché to celebrate the ascent of affect in Hollywood—it having become the organizational (or disorganizational) principle of so many films, including the action flick. One might finally be allowed to assert that even with the decline of plot to a mere appendage of, or excuse for, the strings of over-the-top visceral scenes, narrative never actually died and is in fact doing quite well, thank you, even in films such as Mad Max: Road Fury. If nothing else, the debate over the movie’s feminism tells us that some meaning is still hidden in it somewhere among the affective excesses. Yet, there is no doubt that plot has become a subservient element in many action movies, curiously switching places with the affective itself: what was once mere ornament has become a hegemonic functional principle, while, plot, that old cumbersome causal chain of events, has been itself degraded to a decorative status, a mere vestige of the obsolete. We are probably not far from the day in which action movies will consist solely of constellations of affective scenes, thereby getting rid of plot altogether (the Saw series of movies definitely comes close to this already). Whether one can withstand, let alone enjoy, the constant hammering at one’s nervous system seems in part to be a generational question, one which we will not address here, even if in it we can perhaps find the feeble remnants of modernism’s attempt to shock their bourgeois audience. Yet, there is nothing more formal than the embodied viscerality of affect in films such as Mad Max: Fury Road George Miller 2015). No matter how often affect theorists insist on the incapturability of affect in meaning or form, there could be no doubt that on the level of filmmaking, affective supercharges are more carefully planned and executed than perhaps anything else in the world of film (and this should also signal to us that the convergence of mastery of affect and painstaking attention to visual detail, such as in Wes Anderson’s films, is no accident). It is on the level of form, therefore, that narrative’s preponderance reemerges in even the most purely affective films. The remnants of plot in the new Mad Max, which hardly cohere, do not in any way enact the cognitive estrangement, to use Suvin’s terms, of serious science fiction. Whatever political content the plot does hold is clearly secondary to the movie’s affective focus. As in many films, the opening of the new Mad Max gives us something like a key to its understanding: the slowing of the rate of filming in the opening scene—that flickering which makes action look as if slightly fast-forwarded—is no accident here. It queues the viewer to a particular formal pastiche of older filmic form, in which it was the technological limitations of film itself that created the distortion of pace. Mad Max, however, seems to have a more specific referent in mind: Charlie Chaplin’s movies, and in particularly Modern Times (Charles Chaplin 1936) with its organizing thematic of human violent encounter with a new industrial urban existence. The bodily focus of the original is undeniable, captured most strongly perhaps in Chaplin’s character getting stuck between industrial gears or trying to escape the automated feeding machine. The opening scene of the new Mad Max, in which Max Rockatansky (Tom Hardy) is constantly trying to escape the—now partly human—machine, clawing and scratching as he goes, are perfectly analogous to Chaplin’s bricoleur’s attempt to resist fordist industrial violence. The tension between passivity and frenzied activity is captured in Max’s hanging desperately from the chain-pendulum at the end of the opening sequence, trying to stay out of his pursuers’ reach. Other scenes suggestive of Chaplin’s machinic violence can be seen in Max’s attempt to survive while tied to the front of a vehicle during the long first chase or the scene in which he is fighting someone to whom he is physically chained. The grounding affective experience of Mad Max can be described as the combination of gruesome violence and the hilarious, which is the result of its conjuring up of Chaplin, which sends us directly into the tradition of nonsense and slapstick of the Marx Brothers and Laurel and Hardy kind, and its equivalents in the realm of animation. Of these latter, Adorno and Horkheimer already noted long ago their status as last remnants of a resisting folk culture within an increasingly industrialized cultural landscape. Curiously enough, for them too it was precisely the first signs of the decline of plot which occupied them in their brief commentary. 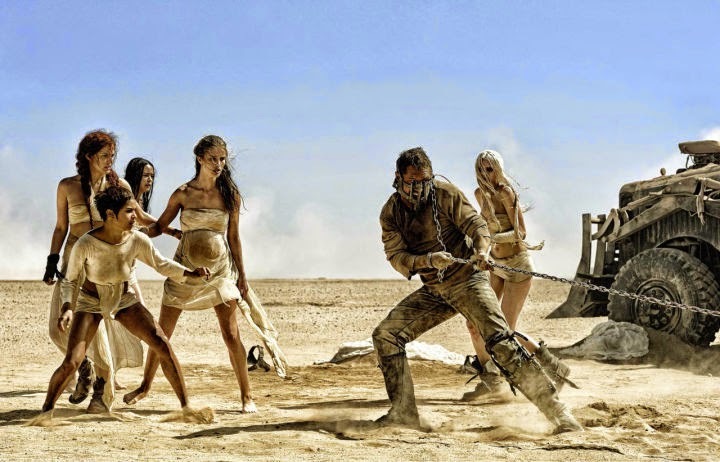 Yet, in Mad Max we are dealing not with the real thing—modernism—but with its pastiche. For the Chaplinesque embattled rascal is completely abstracted from its social and economic foundations (in the original it is the advent of industrial capitalism, of course). Nor, as we already said, should we look to the sorry excuse for a social setting and a plot for a renewed social content, even if these latter do feebly invoke biopolitics, surplus populations, extreme scarcity, and a rigid class system. In other words, the affective supercharges and their particular formal determinants do not function here as figures for the social. Rather, they themselves become objects of ironized play. The parodic distance is perhaps clearest in the scene in which we first see the women that were hidden in the truck, which visually invokes the use of good looking women in action films and commercials alike. Also obviously ironic is the Max’s grunts after emerging injured from wildly violent confrontations. These ironically evoke Mel Gibson’s “mad” characters of Lethal Weapon, or Die Hard’s Bruce Willis’s performances. Thus, to the Chaplin pastiche we have to add that of the 80s and 90s action films, whose form is ironically invoked throughout Mad Max. While in Lethal Weapon and Die Hard series some personal unfinished business between the arch-cop and arch-criminal many times allows for plot to happen, in Mad Max the action is completely flattened, as some merely professional confrontation between anonymous combatants. This radical flattening poses a challenge for the very long, affect packed, chase scenes: they are so long, that some form is necessary in order to give them any logic at all. It is here that a sort of mythological structure is mobilized, replete with references to passing into Valhalla after glorious death in battle. In the first chase scene, various characters approach the “immortal” with a plea to let them engage the renegade vehicle in the name of mythical glory, which allows for some structure to be set in motion. It was Erich Auerbach that posited the compatibility of flatness and the Homeric myth. When in the Illiad two legendary antagonists are about to fight each other, this flatness is expressed according to Auerbach in the long breaks from present action, in which the histories of both figures is told (thereby allowing for generating something like historicity). In Mad Max, in contrast, no such opening to history happens. The mythological structure is only there to further the affective bombardment. The tragedy of the individual is thus merely pastiche as well, with no significance for a larger collective history. What kind of historical narrative, then, does the new Mad Max offer its viewers? If the postapocalyptic landscape does not generate here historical thinking through what Suvin called cognitive estrangement, and the point of closure—the masses’ taking back control of water—is merely another instance of pastiche (with its own set of coordinates, within which the classical Western is an important reference point—think of the protagonist of Shane, saving the helpless farmer town from the menace of the Rancher’s “primitive accumulation,” then riding off into the wilderness), what kind of deeper logic undergirds the movie’s formal play? If the postapocalyptic setting of Mad Max is nothing but the catastrophe which is already here—as Zizek and others claim—then the formal invocation of so many instances of “action” movies (from Chaplin, through the Western, all the way to the 80s and 90s action blockbusters) enacts here something like a frenzied search for an appropriate form to narrate the present catastrophe. Mad Max enacts a kind of allegorical encounter between our apocalyptic present and an array of representational vehicles through which this present might be captured. The difference between Mad Max’s frenetic search for form and that of so many similar searches in Modernism is that here we enjoy the failure to find an appropriate form – as if trying to enjoy trauma. To conclude, it is only through affect that we can unpack the new Mad Max. The pastiche of modernism and earlier postmodern moments reveals itself only through the ways in which affect is generated. Yet—and this is an important “yet”—narrative itself never goes away just because affect becomes hegemonic formally; rather, even in pure affective films such as Mad Max, historical narration is still unconsciously active, in the frenzied attempt to find a form of thought that might make it possible for us to imagine the present as a space of historical collective practice. Oded Nir recently received his PhD from the department of Comparative Studies at the Ohio State University. His work focuses on Marxist notions of totality, and figurations of collectivity in Israeli literature and culture.